The impetus for Trinidad’s skate park began several years ago when a group of local kids began agitating for a real skating place they could call their own. This group of Trinidad area skaters and cyclists came together as a group called RIP for “Ride In Peace.” With continued effort and a lot of help from some good friends, these folks finally persuaded the city to build the skate park. 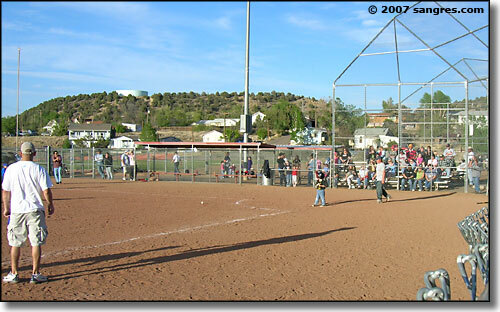 The RIP group started raising money, and with much support from family, friends, and many local businesses, their efforts resulted in the design and building of the park on city-owned land near the Community Center. 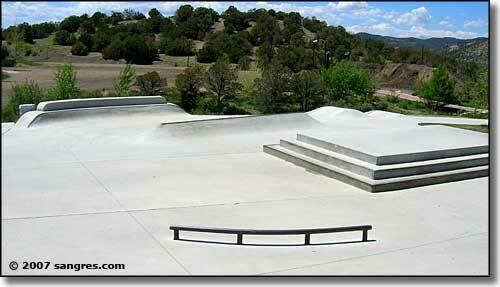 The 15,000 square foot, state-of-the-art skate park was nearly three years in planning and construction. The $205,000 project was funded with a $130,000 grant from Great Outdoors Colorado (Colorado lottery funds), $35,000 from the city of Trinidad, $30,000 from in-kind private donations and nearly $10,000 raised from the Ride In Peace members. 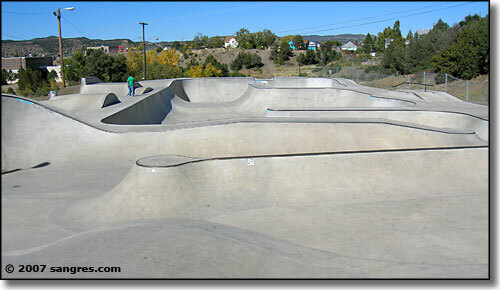 Built in 2003 by Grindline Skateparks, Inc. of Seattle, WA, Trinidad now has one of the top ten rated public skateboarding parks in the world, and the best skate park in the state of Colorado. Grindline is an internationally known company that offers a full range of low-priced Skatepark Design and Construction Services. Since 1992, this multi-million dollar business founded by Mark Hubbard and Chris Hildebrand knows what skaters want, and designs courses that appeal to a wide range of skaters and cyclists. Today, it's normal to see helmeted adults and senior citizens and padded and helmeted toddlers sharing the runs and the ups and downs of the cement curves or pushing their luck on the long, snaking grind rails. If you listen, you'll hear accents from all over the world, all talking about how incredibly "cool" is this, and how "gnarly" it is to skate "the world’s longest grind on the 120-foot wall”. We have no idea how many people use the skate park each year, but skaters from as far away as Australia come here to enjoy our park. 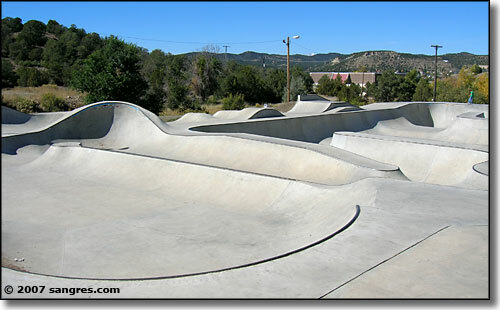 In the first month after its March, 2003 opening, Trinidad's skate park saw more than 70 BMX cyclists, in-line skaters, and skateboarders from southern Colorado and northern New Mexico each weekend, and probably 50 users each weeknight. Since then, the numbers have only increased. 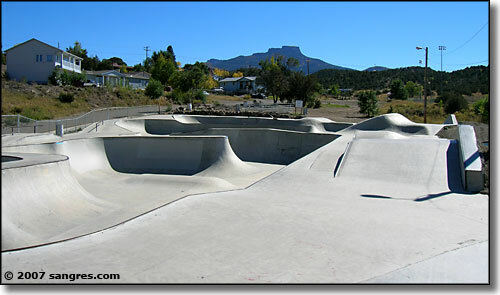 Because of its success and the number of avid users, the skate park has been expanded to add amenities like shade structures, restrooms, more benches, sidewalks, grassy areas, new grinding rails, a pyramid, and a flat surface for beginners to practice some simple street skating activities. 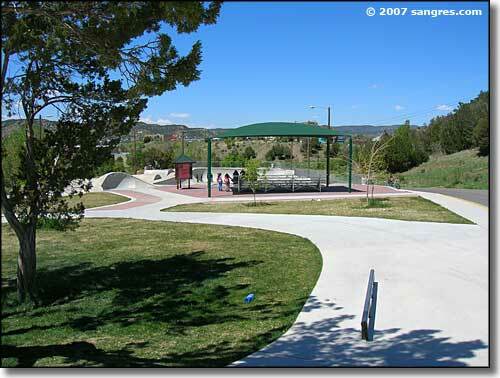 Funded with another Great Outdoors Colorado grant, the expansion also includes the completion of the adjacent disk golf course just to the east of the skatepark. This disk golf course (disk golf is a fast growing sport throughout the country) was designed with input from professional disk golf players. The nine basket disk golf course incorporates the idiosyncracies of different sizes and weights of disks for different forms of competition. 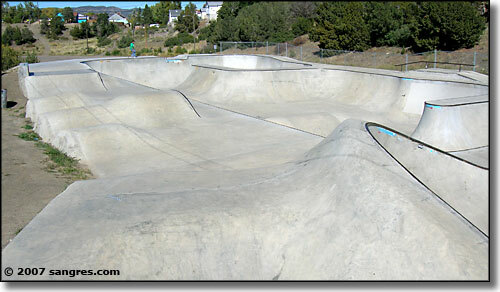 Trinidad’s state of the art skate park is maintained mostly by its' users under the active direction of an adult citizen of Trinidad. Because the park offers a safe place to hang out in the community, residents and visitors alike help keep the park clean and user-friendly. The Trinidad Parks and Recreation Department comes in once a week to clean up and haul trash that the skaters deposit in trash bins at the site. The skatepark's regulations are simple and respectful. Use the park at your own risk. Skate within your abilities and have fun. Use of safety equipment including helmets, knee and elbow pads, wrist supports, and proper shoes is required and must be worn at all times. All users are responsible for providing their own equipment and ensuring that it is maintained and in good working order. Pegs on bicycles MUST be Skate Park friendly, rounded at the ends to protect the surface of the facility (plastic covers preferred). Profanity, recklessness, and rowdy behavior are prohibited. 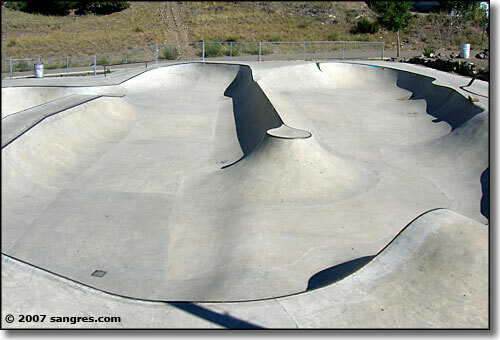 No modifications to the Skate Park or makeshift items allowed on, or in, the premises. Skating is allowed only in authorized areas. Respect the neighborhood and avoid excessive noise. Loud music will not be tolerated at ANY TIME. Keep food and beverages off the skating surface and use the trash cans. No tobacco, alcohol, or glass containers. Spectators should observe from outside the skating area. Keep Our Skate Park Clean. Hours of permitted use are 8 AM to 10 PM. The City of Trinidad reserves the right to revoke use of the site privileges for individuals that do not follow park regulations. Skateboarding is a sport and culture that has always embraced individuality and independence from the constraints of society. It offers children a place to belong when nowhere else seems to embrace them. Looking beyond the unorthodox clothing styles, the jibe language, and the whirring wheels, we find that skaters can walk into most any skating place with a skateboard under their arm and automatically begin making friends and finding a place to belong. So mom and dad, put your fears aside, get out those suitcases, pack up the kids and their skateboards and head to Trinidad where you and your kids can have the vacation of a lifetime. 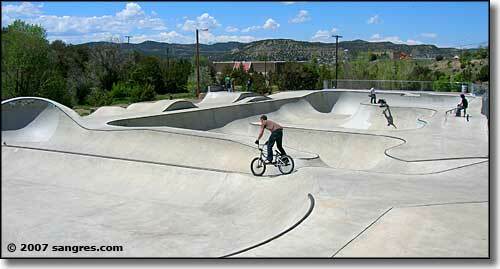 Directions: To get to the Trinidad Skateboard Park from out of town use exit 13A on the I-25 at Main Street. Turn right at the 4-way stop on Santa Fe Trail Drive by the Sonic Drive-In. Go up the hill to Jefferson (fourth street on the left) and turn left. You'll see signs for the Community Center and the Skate Park. Turn right at the second right and stay left for approximately 500 feet.